It's finally Friday. Not that I am counting the days away because I really love the month of December. I just would rather be at home with my family. Plus right now, I am flying home from Palm Springs where it has been in the high 70s and I am headed home to the low 40s. Brrr. ONE. While I didn't write out our Christmas Bucket List, I have kept a mental note of it. One of the items is baking cookies with my girls to leave out for Santa. This weekend we are doing just that. We are baking sugar cookies at my parents house and letting the girls decorate them. I think they will love that. Plus they will love eating the toppings and finished cookies even more. TWO. 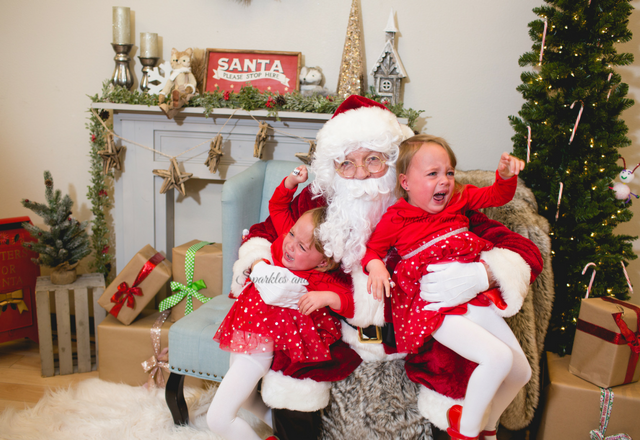 Last weekend we took the girls to meet Santa and take photos with him. The girls were soooo excited to see Santa. They talked about it all week. Whenever they saw Santa on tv, they screamed his name. When we got to the place to meet Santa, the girls kept saying where is Santa and were super eager. That was until Santa walked out. Sutton immediately started crying and wanted up. Avery saw her sister get scared, so she got scared and wanted up as well. Then it was our turn to take our photos with Santa. As we got closer the girls started crying hard and screaming. The photographer told us to drop them and run. And that we did. Here is how it turned out. THREE. We are knocking another bucket list item off our list this weekend as well. We are going to look at Christmas lights in our city. I am sure we will do this several more times before the holidays are over, but this is our first official light looking of the season. FOUR. Every night we read stories to the girls before bed. They are obsessed with their Olivia book. 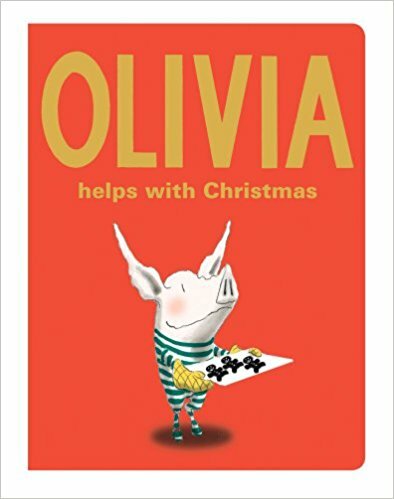 Recently, I saw an Olivia Helps with Christmas and then I saw that there is a whole line of Olivia books (here). Do you have any books you can recommend that your kids love and want to read over and over? The girls also love the board book Madeline. FIVE. 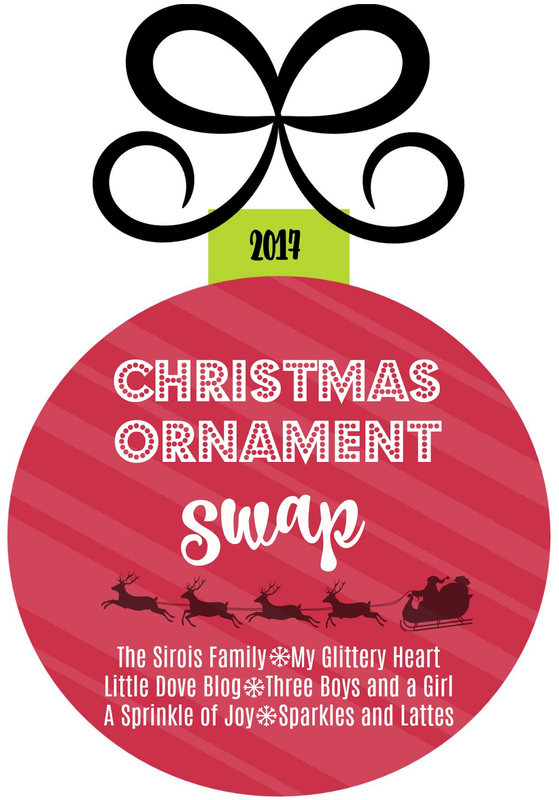 If you are participating in the Blogger Ornament Exchange, don't forget that the link up is Tuesday, December 12th. I can't wait to see the ornaments that you all received. That santa pic is epic! I love it!! Can't wait to see all the ornaments that were given. I just got my packaged yesterday. Have a great weekend! OMG..the pic with Santa should be featured somewhere like the Ellen Show, so stinking' cute and classic. My boys used to get so amped up for him and one would hide behind my leg holding on for dear life! I Hope you have a sweet and joyous weekend! I should submit it there. It is just the best. 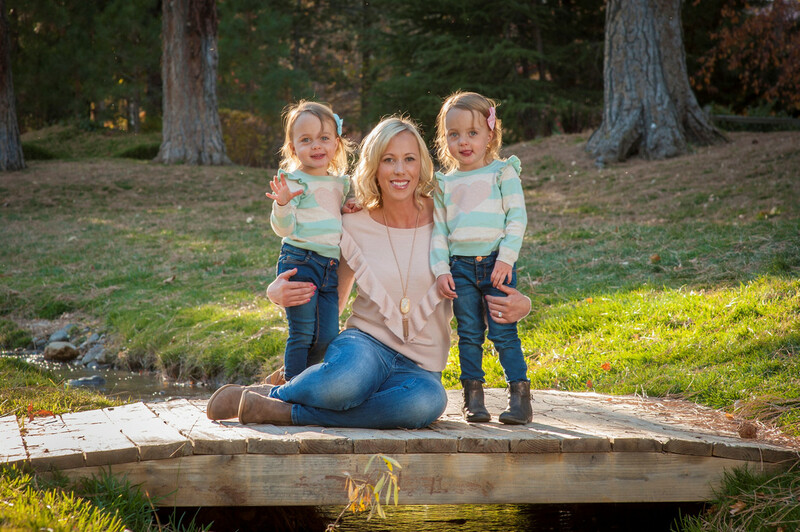 I wonder how long my girls will have photos like these ones. Ohhhhhh my gosh, That pic did not disappoint. Haha. Poor Santa. Have fun baking those cookies. They will have such fun.,start a tradition now with them doing that. The santa photo is one for the books! I love the santa photo! My coworker just showed me hers and her similarly aged daughter had a similar face. Travel safe and stay warm! We saw Santa last week and the kids weren't crying, but they were so fascinated by Santa that they wouldn't turn around for the pictures. So we have a picture with the back of their heads. Haha. That is probably a funny photo too. My girls were fascinated with him the first year too. That Santa pic, nailed it!!! We took Zoe today and I was shocked that she just sat in his lap no problem. Hope you have the best time looking at Christmas lights and baking cookies! That Santa photo is classic! These are my favorite! My middle farmer had been going on and on about Santa. When it came down to it, he wouldn’t even be in the same room as him. Haha. I am laughing at the photographers instructions though! Enjoy the cookie baking!! Ok that Santa picture is hilarious!!! So many kids are afraid of Santa. I know it's not funny but at the same time it really is.